What makes someone in San Diego a local is sometimes debatable, but it’s hard to dispute the status of the folks who got together at the Bay View Restaurant at the Marine Corp Recruit Depot on Friday, Sept. 24. 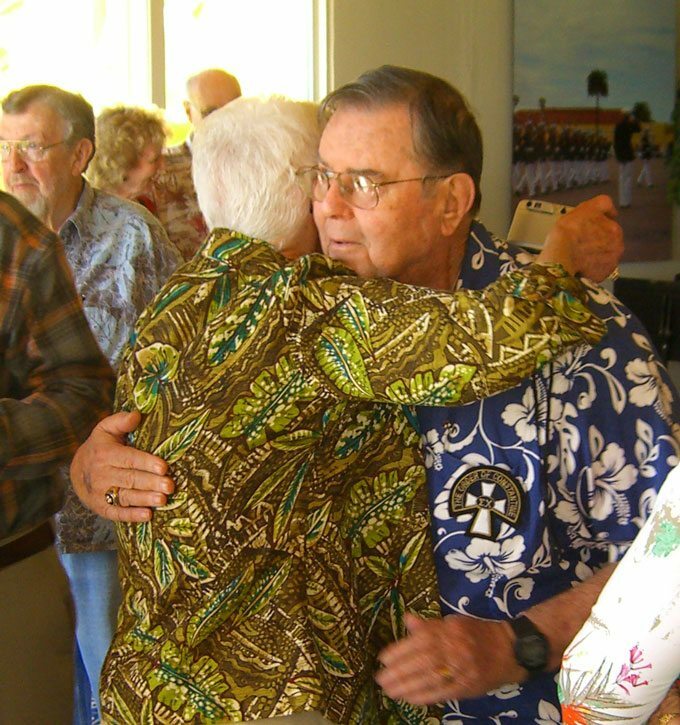 This was the 60th reunion of Point Loma High School’s class of 1950, a festive and feel-good gathering of folks who can out-local just about anybody on the Peninsula. 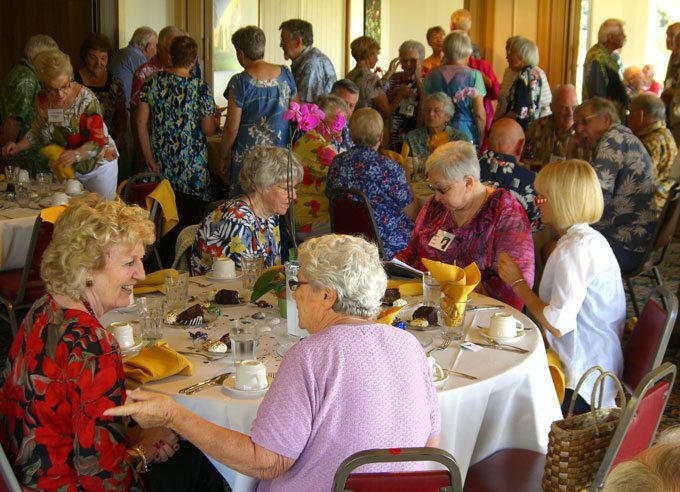 Now age 77 or 78, many of the 1950 grads continue to make a home in Point Loma, Ocean Beach, or other parts of San Diego. Others made trips from places like Palos Verdes or Bend, Oregon or Billings, Montana. “It’s wonderful that so many people live in the area, so we can do this,” said Mary Louise Ross, a class member who helped organize the event. Milton, who recently moved to Billings, where his children now live, was sitting with his classmates Eric Brelin and William Howard Mayfield, both still residents of Point Loma. “I still live in the same house I was raised in, on Bermuda,” said Mayfield, who played on PLHS’s championship football team in 1949. William Howard Mayfield greets a friend. Mayfield remembered a road game when the Pointer footballers realized their belts hadn’t been packed with the rest of their equipment. “I had to tackle with one hand holding my pants up,” Mayfield laughed. At halftime, however, with the Pointers down 12-0, the belts appeared, and the tempo of the game changed. “We won 42-12,” Mayfield said dryly. Milton said that, as a youth, he swam in the salt water of the Silver Spray Plunge near the foot of Niagara Avenue. Brelin remembered seeing Saturday movies at the Strand Theater at a cost of 10 cents per ticket. 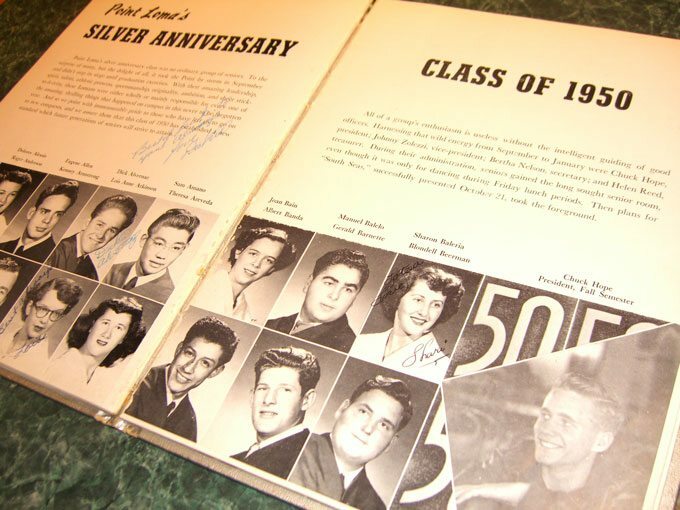 PLHS’s class of 1950 consisted of about 300 graduates. Today, around 100 of those graduates are deceased and nearly 70 are out of contact. Nonetheless, the 60th reunion boasted an impressive turnout. 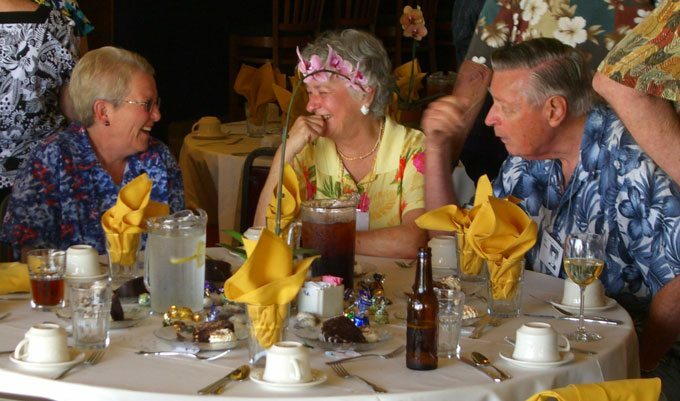 Susanne Cramer Ballantyne, a class member who led the planning of the reunion, said about 75 or 80 people attended, including class members and their guests. 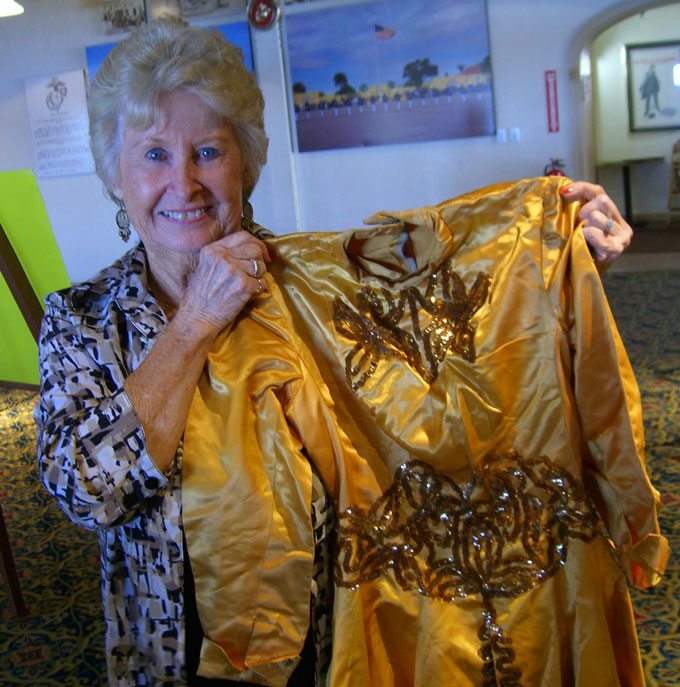 Grace Woodie Blake shows the uniform she wore as colonel of the Lomanettes. Grace Woodie Blake brought the gold-sequined uniform she wore as colonel of the Lomanettes, a PLHS ensemble that resembled a more sophisticated version of today’s drill teams. Blake showed me a black-and-white picture of the Lomanettes in the 1950 edition of the PLHS yearbook, El Portal — and in the picture, she’s wearing that same uniform. As lunch wound down, class member Howard Wiggins introduced each of the 1950 grads in attendance and their guests. When Wiggins mentioned that one 1950 class member had been accompanied by his wife, who was class of 1952, I thought someone might yell “Sophomore!” but no one did. Wiggins provided updates from 1950 grads who had responded that they couldn’t attend. He also mentioned the names of class members who had passed away recently. Standing to the right of the man holding the songbook are Howard Wiggins, Mary Louise Ross, and Marshall Milton. “I think we had an extraordinary class,” Marshall Milton told me earnestly. Mary Louise Ross voiced a similar sentiment. “This was an absolutely fabulous class,” she said. But Milton and Ross didn’t just talk the talk. 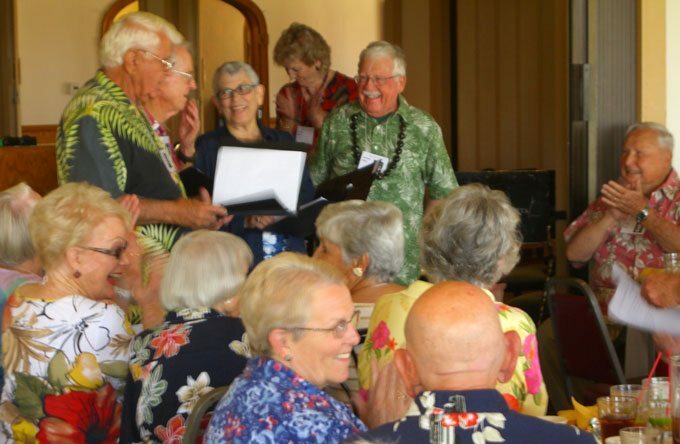 Soon after lunch ended, they picked up ukuleles and joined a few of their classmates to perform lively Hawaiian songs for the enjoyment of the other reunion attendees. Smiles and good cheer were in abundance at that moment, and throughout the event. Here is a gallery of photos taken by Shane Finneran. as a class of 1968 alum, i tip my hat to to all these folks. i hope i look that good when i hit that age. I salute these folks, from a 1971 PLHS grad. Thanks Shane for highlighting these folks who graduated high school 2 years after I was born. They are truly great people. PLHS Class of ’66. shows real class when a younger person like shane can go to one of these high school reunions – something one should never drag a spouse or main squeeze to (unless they insist just to keep an eye on you) – and come back with such a wonderful story with excellent photos. keep up the classy work, man. This article just totally made my day. My mother *Sharon Baleria* passed 9/21/10 ….I open the article and there she is…looking beautiful as always in her senior pic=)!!! Hope everyone had a wonderful time! The comment that Amalia Ortiz sent regarding Sharon Baleria, totally “made my day” Sharon was my very best friend all through OB elementary, Dana Jr. Hi and Point Loma and I found out about her passing. I, too was so glad to see Sharon’s picture in the page of the Annual that was shown in the article and thought it was kind of ironic and sort of a memorial to Sharon. Older Article: Anti-War Activists in the Nation’s Heartland Under Attack!